I absolutely love pumpkin. My Mom would make an amazing soup with pumpkin, onion, spinach beans and rice… so yummy! When I make it myself I trade the rice for some pasta and add thyme, who knew? Thyme plus a splash of my mother-in-law’s fresh olive oil, can’t beat it! After devouring a million versions of this soup I finally decided to get some guts and make something I typically would be scared to make and just go for it. I googled pumpkin recipes and found an open faced recipe really intended for butternut squash on Smitten Kitchen. It’s called a galette, a French term for a free formed crusty cake. 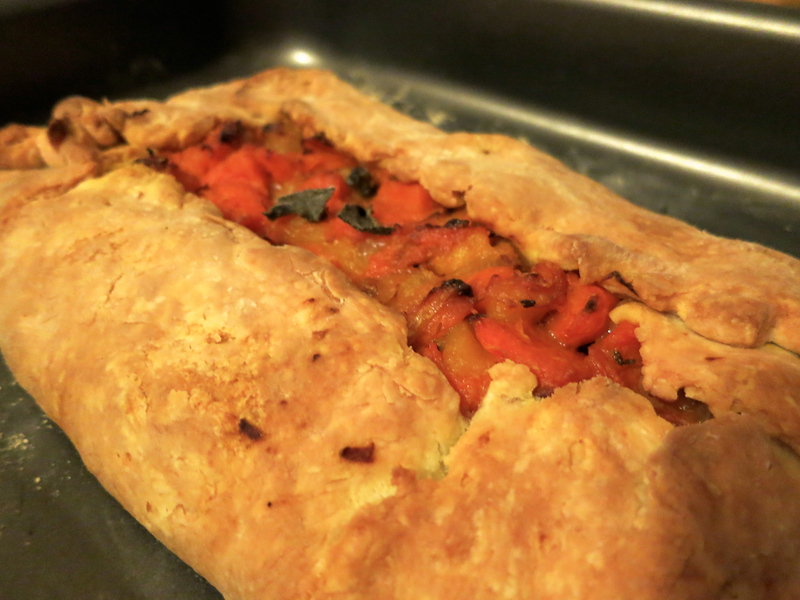 I swapped the squash out for pumpkin and carrots et voilà, my very first pumpkin galette! Hopefully, you will try to make this dish and have your eyes roll waaaaay back when you try it for the first, second and third time. The first bite changed my life. I couldn’t get over how great it was and that I actually made it. I was really impressed and have now made it my go-to for the Holidays and friend’s houses besides the good ‘ol trusted banana bread. If you try it, please let me know how it went. In a bowl, combine the flour and salt. Make a well in the center of the flour. Add the butter to the well and mix it with a mixer (preferably a pastry blender) until the mixture resembles coarse meal. Make another well in the center. In a small bowl, whisk together the sour cream (or yogurt), lemon juice and water and add half of this mixture to the well. With your fingertips, mix in the liquid until large lumps form. 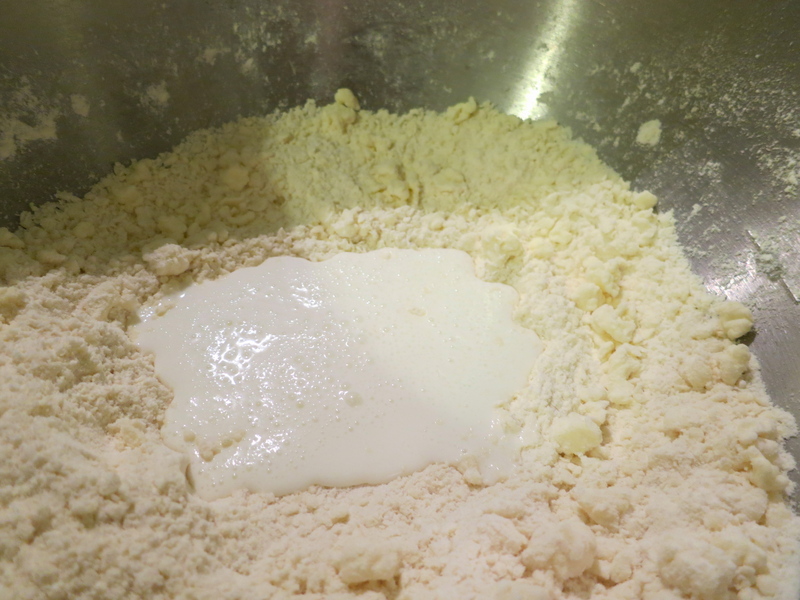 Remove the large lumps and repeat with the remaining liquid and flour-butter mixture. Pat the lumps into a ball—don’t overwork the dough. Cover with plastic wrap and refrigerate for 1 hour. Preheat oven to 375f/175c. Cut up a quarter of a pumpkin into a 1/2-inch dice along with the carrot. Toss pieces with olive oil and a teaspoon of the salt and roast on foil lined sheet for 35 minutes or until pieces are tender, turning it midway if your oven bakes unevenly. Set aside to cool slightly. While the pumpkin and carrot are roasting, melt the butter in a heavy skillet and cook the onion over low heat with the remaining half-teaspoon of salt and pinch of sugar, stirring occasionally, until soft and lightly golden brown, about 20 minutes. Stir in cayenne. Raise the oven temperature to 400f/205c. 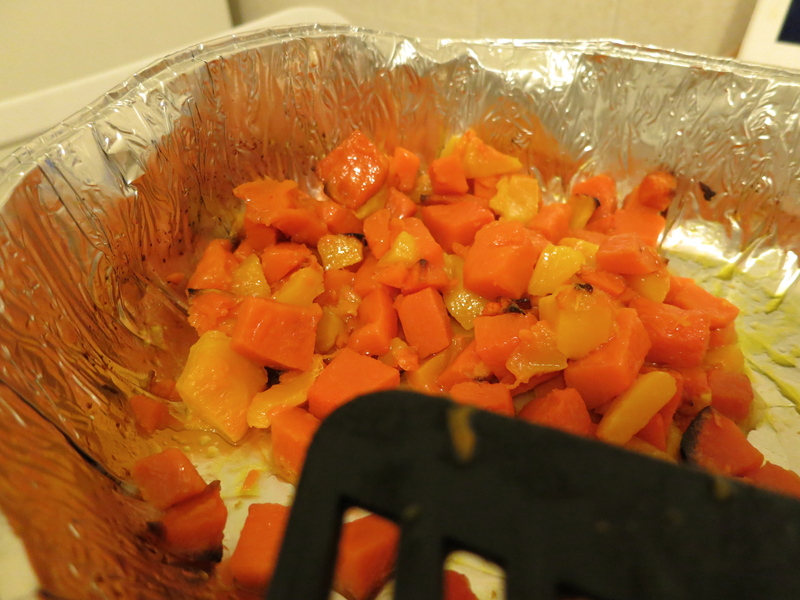 Mix pumpkin, carrot, caramelized onions, cheese and herbs together in a bowl. 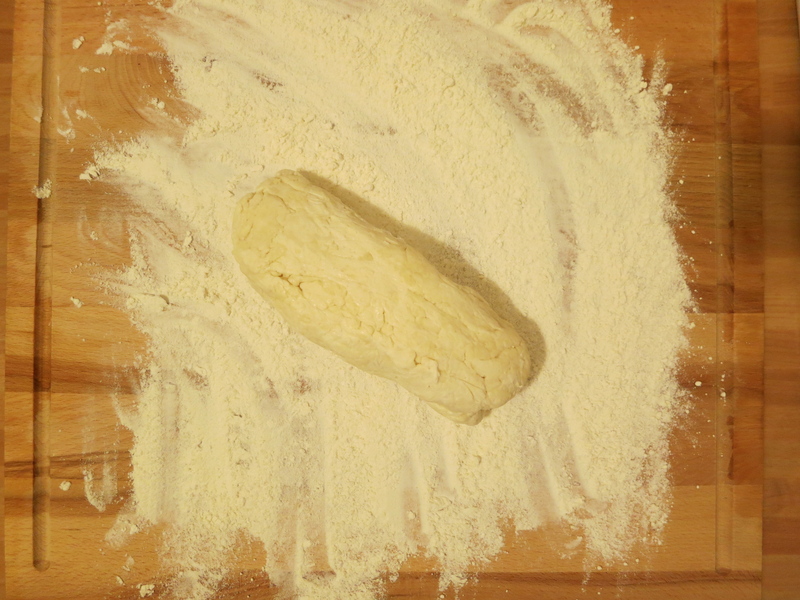 On a floured work surface, roll the dough out into a 12-inch round. Transfer to an ungreased baking sheet. 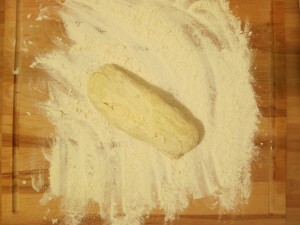 Spread the mixture over the dough, leaving a 1 1/2-inch border. Fold the border over the mixture, pleating the edge to make it fit. The center will be open. 30 to 40 minutes until golden brown. 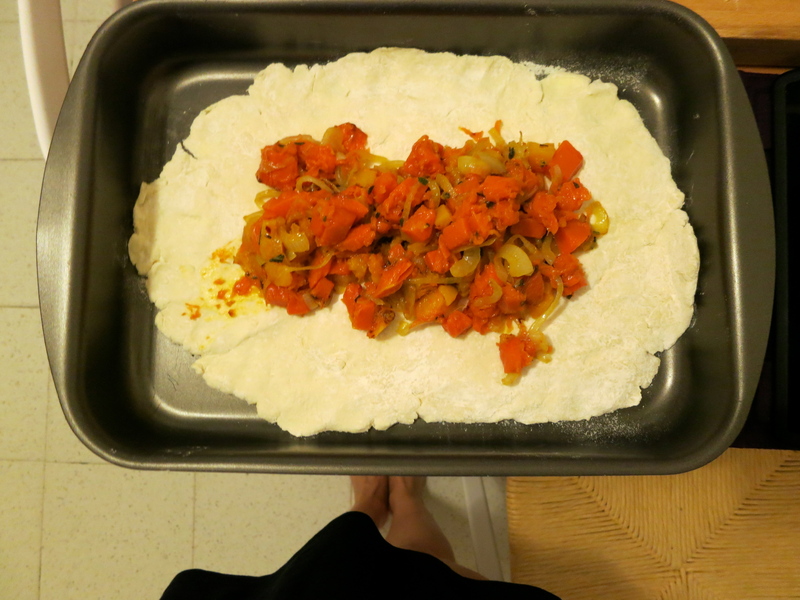 Remove from the oven, let stand for 5 minutes, then slide the galette onto a serving plate. Cut into wedges and serve hot, warm or at room temperature. It serves 6, but Nicco and I killed it on our owns the first time I made it. Yum! Where I work, we have ‘pastry Friday’ because we all just adore pastry! 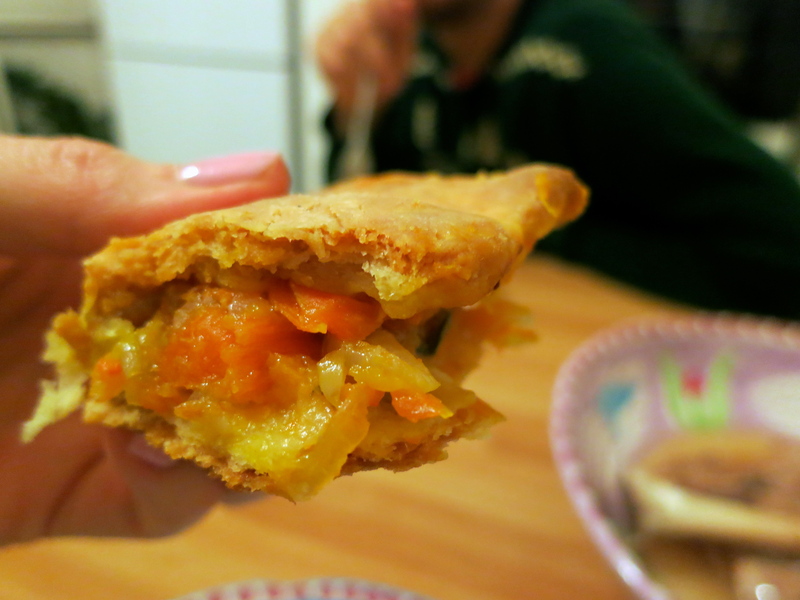 Anything wrapped in a layer of golden pastry always taste better! One of our go-to recipes is very similar to yours, we spread loads and loads of caramelised onions over the base and sprinkle the pumpkin with feta. I like the idea of folding it up though, nice! Yes, this pastry is amazing. I need to start using the same pastry for other dishes, since I got this one down, I can now play with other fillings. This one calls for Fontina cheese, which I left out, but totally need to add some kind of cheese next time like your feta. Cheese always adds so much more to the dish. Thanks for stopping by! I just love having pastry. Pineapple pastry, strawberry pastry…and the list would be never ending! Can’t really think life without them. Yum, I am a pineapple addict as well! Who can say no to that!? I love anything with pumpkin in it, will definitely have to try this one out! You have to. Put on some music, pour a glass of wine, and have fun. I really enjoy making this dish. When you see how great it tastes you will find out why! Let me know how it goes!